Above-elbow amputations are indicated for advanced soft-tissue and bone sarcomas of the forearm; below-elbow amputations are performed for such tumors of the forearm and the hand. 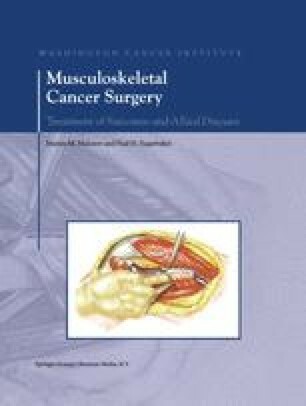 The location of the tumor mass on the medial aspect of the distal arm and elbow joint, in close proximity to the main neurovascular bundle, may in large part determine feasibility of a limb-sparing procedure. Above- and below-elbow amputations are performed to achieve wide surgical margins while preserving as much length as possible of the extremity. The level of amputation will vary with the location of the tumor in the forearm, at the elbow joint, and even at the lower portion of the arm. During the procedure, muscle flaps are tapered and closed tautly in two layers over the cut ends of the bones in order to facilitate mobility. A rigid dressing is applied immediately postoperatively to decrease pain and edema and facilitate maturation of the stump.